28 March 1913: Lieutenants Thomas DeWitt Milling and William C. Sherman, Aeronautical Division, Signal Corps, United States Army, set two American Cross-Country Nonstop Records for Distance and Duration by flying a single-engine Burgess Model H Military Tractor (also known as the Burgess-Wright Model H) biplane from Texas City to San Antonio, Texas, a distance of 220 miles (354 kilometers), in 4 hours, 22 minutes. During the flight Lieutenant Sherman drew a map of the terrain. American Cross-Country Nonstop Records.—The Aero Club of America, on recommendation of its Contest Commitee, has adopted the following, relative to cross-country flying, nonstop records: Duration—Aviator With Passenger.—Lieutenant T. DeWitt Milling, Texas City, Tex., to San Antonio, Tex., March 28, 1913, Burgess-Wright tractor biplane, 70-horsepower Renault motor; time, four hours, 22 minutes. Distance—Aviator With Passenger.—Lieut. 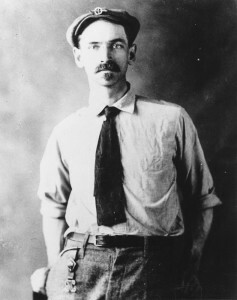 T. DeWitt Milling, Texas City, Tex., to San Antonio, Tex., Burgess-Wright tractor biplane, 70-horsepower Renault motor; distance covered, 220 miles. The U.S. Army Signal Corps purchased six Model H biplanes for $7,500, each. They were assigned serial numbers S.C. 9 and S.C. 24–S.C. 28. The Burgess Model H was a two-place, single-engine biplane which could be ordered with either wheeled landing gear or floats. It was built by the Burgess Company and the Curtiss Aeroplane and Engine Company, under license from Wright. The airplane was powered by a normally-aspirated, air-cooled, 6.949 liter (424.036 cubic inch displacement) Renault Limited left-hand tractor 90° V-8 engine with a compression ratio of 4.12:1. The engine produced 70 horsepower at 1,750 r.p.m., burning 50-octane gasoline. The V-8 drove a two-bladed propeller at one-half of crankshaft speed. (The propeller was driven by the camshaft.) This engine, also known as the Type WB, was manufactured by three British companies: Renault Limited, Rolls-Royce Limited, and Wolseley Motors Limited. The airplane had a maximum speed of 72 miles per hour (116 kilometers per hour). Thomas Milling was issued the Fédération Aéronautique Internationale‘s pilot certificate number 30, and the Army’s Military Aviator Certificate No. 1. He was the first U.S. military officer authorized to wear a military aviator badge as part of his uniform. 2 August 1909: The United States Army Signal Corps purchased a Wright Flyer for $30,000. It became the first aircraft in the United States’ military inventory and was designated Signal Corps Airplane No. 1. The airplane was used to train Signal Corps pilots at Fort San Antonio, Texas. It was crashed and rebuilt several times. After just two years’ service, the airplane was retired. The Army donated Airplane No. 1 to the Smithsonian Institution. 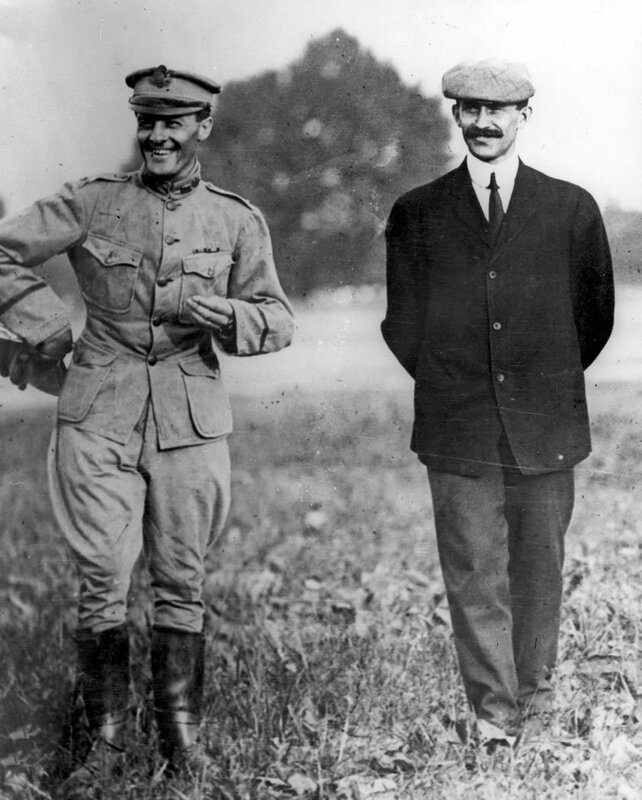 During test flights that were conducted prior to acceptance by the Army, Orville Wright with Lieutenant Benjamin D. Fulois as a passenger (he was chosen because of his size and his ability to read maps) the Flyer achieved a two-way average 42.583 miles per hour (68.531 kilometers per hour), over a 5 mile (8.05 kilometers) course. The Signal Corps specification allowed a bonus of $2,500 per full mile per hour above 40 miles per hour. This increased the purchase price of the airplane from $25,000 to $30,000. The Army also required the airplane to be able to remain airborne for a minimum of one hour. 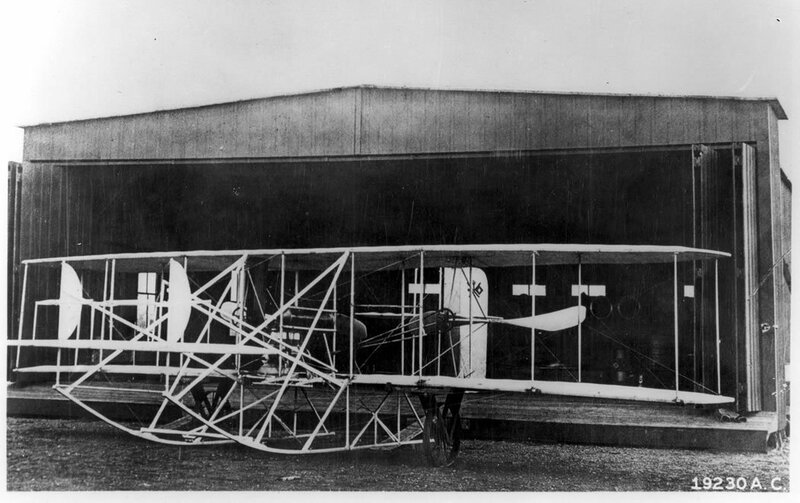 Wright demonstrated its endurance at 1 hour, 12 minutes, 40 seconds. 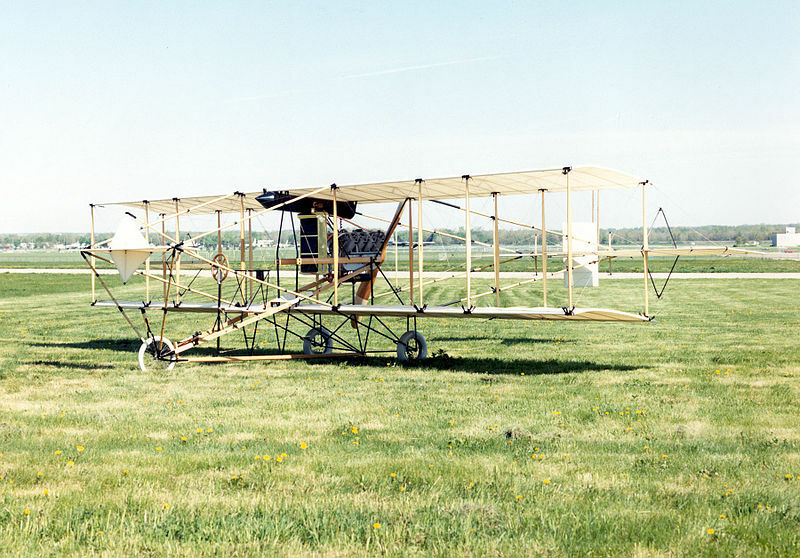 The 1909 Military Flyer is a one-of-a-kind variant of the Wright Brothers’ Model A which was produced from 1907 to 1909. The airplane has shorter wings than the standard Model A, and slightly longer propeller blades which are turned at a different r.p.m. These changes were made to increase the Flyer’s speed through the air. 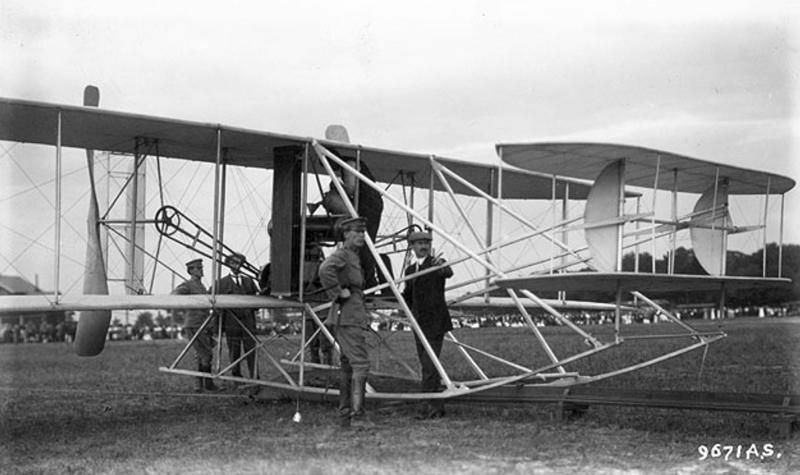 The engine had been salvaged from the 1908 Model A which crashed at Fort Myer in 1908, severely injuring Orville Wright and killing Lieutenant Thomas E. Selfridge. The Military Flyer is a two-place, single-engine biplane built of a wooden framework braced with wires. The wings, rudders and elevators are covered with muslin. The elevators are placed forward in canard configuration with rudders aft. Roll control was by the Wright Brothers’ patented wing-warping system. 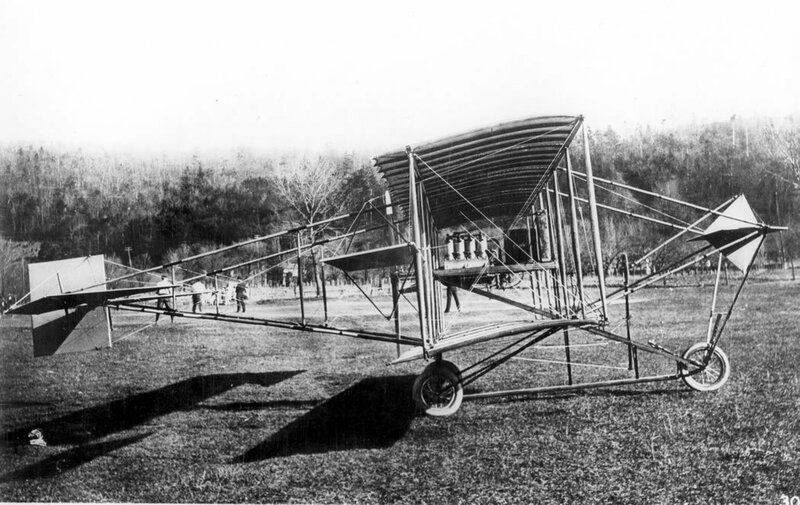 As originally built (it was repaired and slightly modified during its two years in service) the airplane was 28 feet, 11 inches (8.814 meters) long with a wingspan of 36 feet, 6 inches (11.125 meters) and height of 8 feet, 1 inch (2.464 meters). The wings have a chord of 5 feet, 10 inches (1.778 meters) and vertical separation of 5 feet (1.524 meters). The lower wing has 2 feet, 3 inches (0.686 meter) of ground clearance. The elevators have a span of 15 feet, 5 inches (4.699 meters), a chord of 3 feet (0.914 meter) and vertical spacing of 3 feet (0.914 meter). The parallel rudders are 4 feet, 8½ inches (1.435 meters) tall with a chord of 1 foot, 8 inches (0.508 meter). Their lateral separation is also 1 foot, 8 inches (0.508 meter). The rudder pivot point is 15 feet, 11 inches (4.851 meters) aft of the wings’ leading edge. The airplane had an empty weight of 740 pounds (335.7 kilograms). The Military Flyer was powered by a single water-cooled, fuel-injected, 240.528 cubic-inch-displacement (3.942 liter) Wright vertical overhead-valve inline four-cylinder gasoline engine with 2 valves per cylinder and a compression ratio of 4.165:1. It produced 32 horsepower at 1,310 r.p.m. During three years of production (1908–1911) Wright “4-40” engines were built that operated from 1,325 to 1,500 r.p.m. Power output ranged from 28 to 40 horsepower. These engines weighed from 160 to 180 pounds (72.6–81.6 kilograms). Two 8 foot, 6 inch (2.591 meter) diameter two-bladed counter-rotating propellers,are mounted behind the wings in pusher configuration. Driven by a chain drive, they turned 425 r.p.m. The Military Flyer could fly 42 miles per hour (67.6 kilometers per hour) and had endurance of one hour. Early army officers who trained with Signal Corps Airplane No. 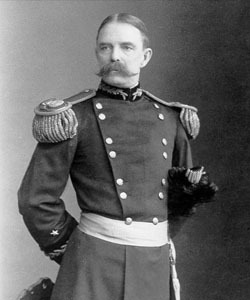 1 included Lieutenants Benjamin D. Fulois, Frank P. Lahm and Frederic E. Humphreys. 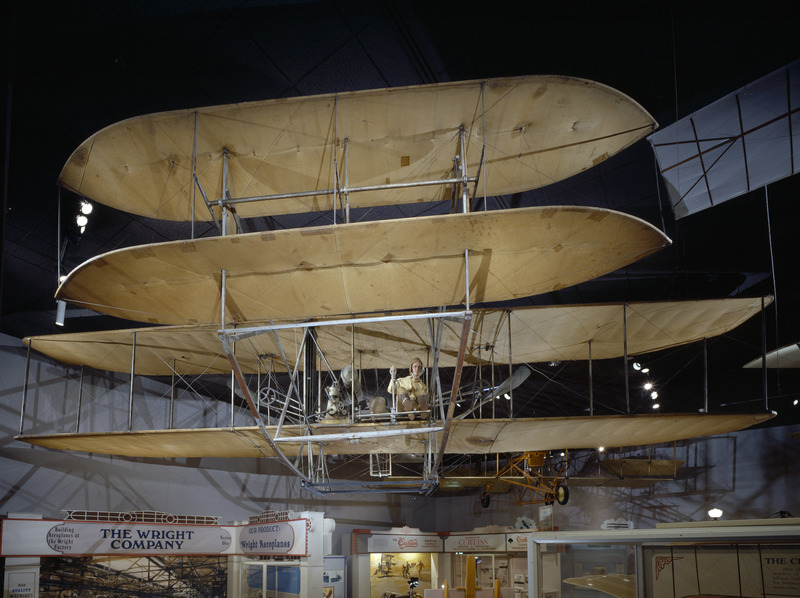 The unrestored Wright 1909 Military Flyer is in the collection of the Smithsonian Institution, displayed at the National Mall. A reproduction of the airplane is at the National Museum of the United States Air Force. 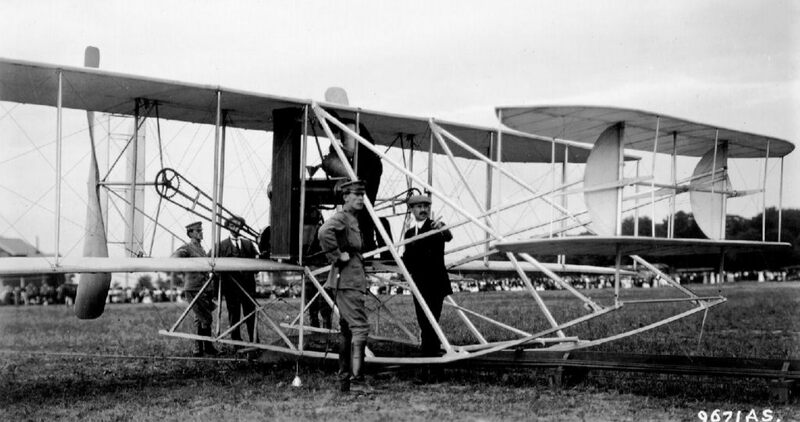 27 April 1911: At Fort Sam Houston, Texas, the Aeronautical Division of the Signal Corps, United States Army, accepted its second airplane, a Curtiss Model D Type IV. The airplane was built by Glenn H. Curtiss’ Curtiss Aeroplane and Motor Company at Hammondsport, New York. It was known as a “Curtiss Pusher,” as it was propelled by a propeller behind the engine. The aircraft was a canard configuration with elevators mounted in front. It had tricycle landing gear. The airframe was primarily spruce and ash, with flying surfaces covered with doped fabric. It was easily disassembled for transport on Army wagons. The Wrights had patented their “wing-warping” system of flight controls and refused to allow Curtiss to use it. 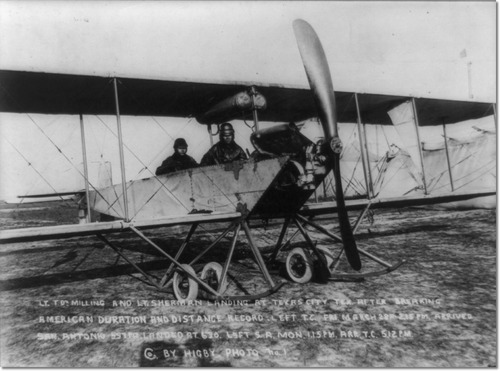 The Model D used ailerons instead, which was a superior system. The Model D Type IV had a length of 29 feet, 3 inches (8.915 meters) with a wingspan of 38 feet, 3 inches (11.659 meters) and height of 7 feet, 10 inches (2.388 meters). Its empty weight was 700 pounds (317.5 kilograms) and loaded weight was 1,300 pounds (589.7 kilograms). The engine was a “Curtiss Vee,” an air-cooled, normally-aspirated, 268.336-cubic-inch displacement (4.397 liter) Curtiss Model B-8 90° V-8 engine, producing 40 horsepower at 1,800 r.p.m. The Model B-8 was 29½ inches (0.75 meters) long, 19 inches (0.48 meters) high and 17 inches (0.43 meters) wide. It weighed approximately 150 pounds (68 kilograms). The engine drove a two-bladed, fixed-pitch wooden propeller in pusher configuration. The airplane’s top speed was 60 miles per hour (96.6 kilometers per hour). Endurance was 2½ hours. The Signal Corps assigned serial number S.C. No. 2 to the Curtiss. 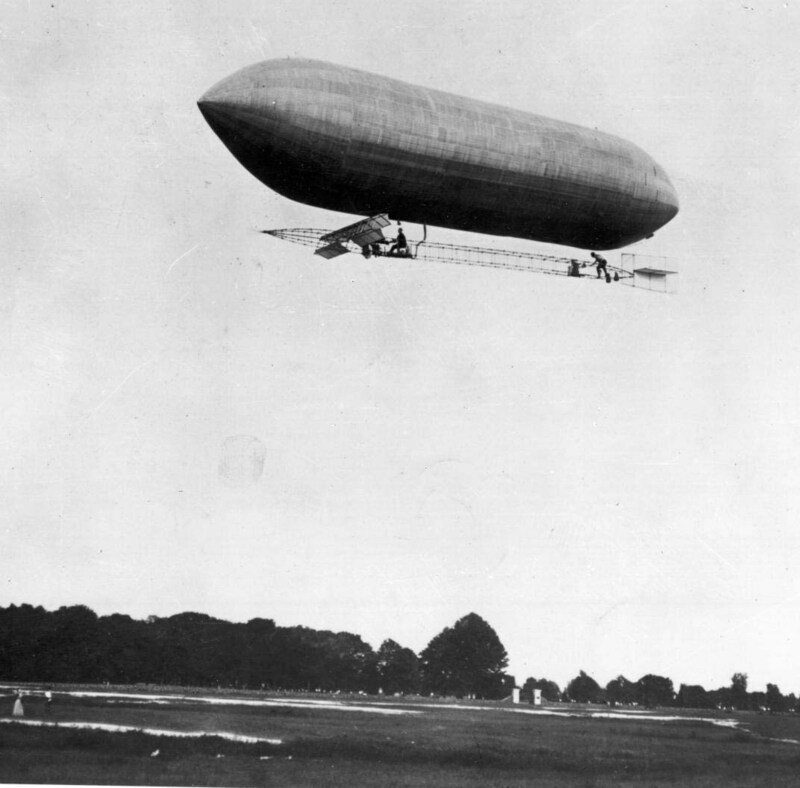 Intended as a trainer, it was in service until 1914, when it was scrapped. A reproduction of S.C. No. 2 is on display at the National Museum of the United States Air Force, Wright-Patterson Air Force Base, Ohio.